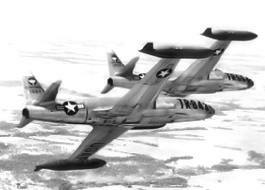 An Air Force T-33 trainer jet like these pictured, disappeared seemingly without a trace in 1956. At least some people believe the wreckage lies underneath a Kosciusko County lake with its pilot and passenger still on board. (The following is the first in a series regarding the mysterious disappearance of an Air Force T-33 trainer jet that, on Dec. 8, 1956, went missing. It is believed the T-33 lies at the bottom of a Kosciusko County lake where it has become an underwater grave for its pilot and passenger. At age 29, Air Force Lt. Frederick Archibald Davis III was an experienced pilot assigned to the 487th Fighter Interceptor Squadron at Geiger Field, Spokane, Wash. There, with nearly 700 total flying hours, he masterfully piloted an F86-D jet interceptor. On Dec. 8, 1956, however, Davis flew his last mission in a T-33 trainer jet, another aircraft he was just as proficient in operating. It was supposed to be a simple cross-country flight. Military records show Davis was to fly Air Force Airman 2C Robert Edward Watkins, 20, to Westover Air Force Base in Massachusetts. Watkins was stationed at a remote radar center in Yak, Mont., and was heading home for a family emergency leave. Lt. Frederick A. Davis III was born Nov. 11, 1927, and grew up in Northford, Conn., which was then a suburban farming community just 10 miles from New Haven, Conn.
King, who still lived in Northford in 2004, said that after high school Davis tried to enter the Navy cadet training program hoping to become a Navy pilot. Cadet training, however, required two years of college. Davis eventually enrolled in the University of Colorado. Upon completion of his college studies, Davis was too old to be a Navy cadet. Though disappointed, he turned to the Air Force and, after fulfilling initial training, was assigned to the Continental Air Defense Command in Spokane, Wash.
King’s recollection of that event is haunting in the sense that Davis’ last flight likely ended when he was unable to avoid a crash into what many believe could be James Lake, also known at Little Tippecanoe Lake. Davis’ passenger that fateful December night in 1956 was Airman 2C Robert Edward Watkins. Born Feb. 6, 1936, “Bobby” Watkins was raised in Reeds Ferry, N.H. Although little is known about him today, Watkins was known to be a go-against-the-grain type of person who did not follow the crowd and usually elected to play by his own rules. In those days, that rebellious nature may have been what ultimately led him to the military. At the age of just 17, Watkins entered boot camp at Sampson Air Force Base. After basic training he was sent to Biloxi, Miss., for radar schooling. The young serviceman’s training would eventually see him stationed at Tachekowa Air Force Base in Toyko, Japan. Back in the states and after his second marriage, Watkins was stationed in Yak, Mont., a remote location where family members of military personnel were not permitted. It was on Dec. 6, 1956, less than three months after his marriage, when he received that news that his wife, Norma, and her mother had been seriously injured in an auto accident. Lt. Davis was summoned to fly Watkins across country to visit his injured wife.